It turns the paring of leather into a simple routine. It even makes it possible to par leather for high precision demands, for instance leather onlays. 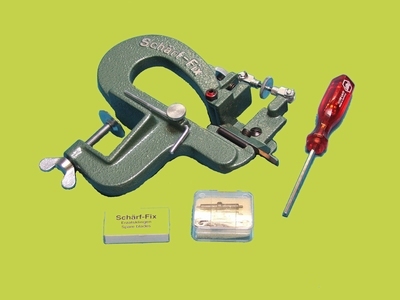 With Schärf-Fix 2000 you can even large leather surfaces and by the adjustable knife you can easily par edges and corners. Schärf-Fix 2000 has cylinders with different widths to make it capable of paring even narrow parts. The patented mechanism of Schärf-Fix 2000 automatically makes the knife stay in the chosen position.